This coming weekend the LMYC will hold a vintage sailing weekend in conjunction with the Vintage Model Yacht Group. Whilst the event will be aimed at owners of vintage yachts, with several VMYG members travelling to Llandudno, you can turn up and sail whatever you have on either day. The VMYG event times are between 10.30 and 14.00 both days but I would suggest that there will be people sailing for most of the day, weather dependant of course! After the maintenance mentioned below the Llandudno MYC lake at West Shore has been returned to a useable state and is now full and ready for some sailing. On the evening of 29th April several members turned out for some informal sailing in a pleasant 6 knot breeze with both radio and vane represented. The next scheduled meeting was supposed to be this coming Sunday 4th May however with the Victorian Extravaganza weekend being held it has been decided to postpone until the following Tuesday evening of the 6th May. If you fancy seeing what model yachting is all about why not pop along and take a look on Tuesday 6th May from around 18.30. Since the devastating storms of earlier this year the lake at West Shore has been in need of some TLC and maintenance. The big tides, storm surge and strong winds had dumped a lot of sand and debris into the lake making sailing there pretty much impossible. 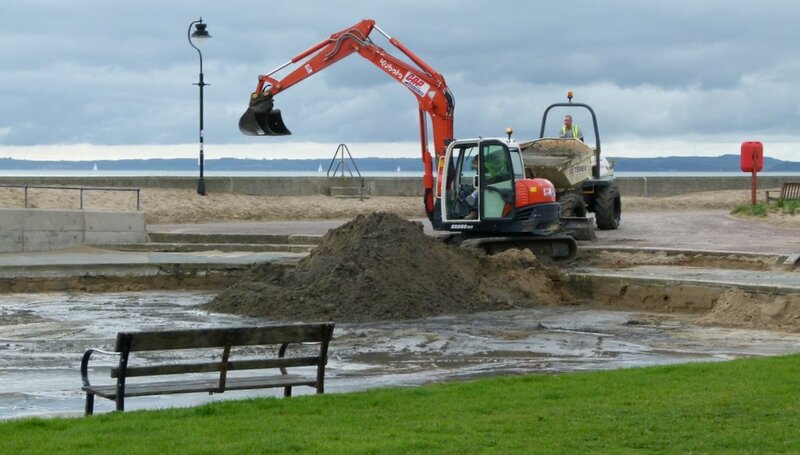 The Council drained the lake a month or so ago which really has made sailing a complete non starter but it seems that they are now taking the necessary action to restore the lake and allow LMYC to get our new season underway, hopefully before Easter. Below is a photo from Dennis Oliver of the works taking place. A light to moderate wind from the Orme end of the lake, the threatening rain clouds held off for the morning and the temperature was a relatively tolerable 7C, fingers were notably a bit stiff today. 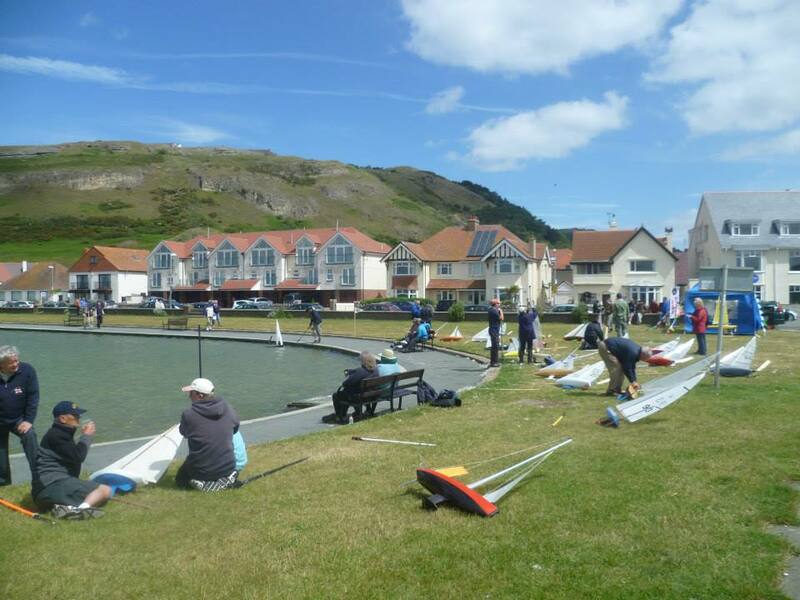 The West Shore lake was busy today with both LlMYC and Colwyn Bay Model Boat Club using the lake. Classes sailed by LLMYC included 2 x dragon force, 3x v36r, 1 x R36r, an IOM with reduced draught. Vane Sailing: A number of 3 boat heats were undertaken with Dave’s Batman “Skimma” being notably fast to windward and Gareth’s “rrrRed” (Mike Dann Design) sailing well downwind. Nicks beautifully restored classic 36r was somewhat off the pace today, some adjustments were made to the set of the sails and his performance seemed to be a little better. Gareth’s upwind problems were traced in part to a problem with the guy spring on his vane gear preventing the vane from toggling to the correct sailing angles. This had been the cause of very inconsistent sailing performance. Removal of the spring in question confirmed the hypothesis. Radio Sailing: Alan’s two Dragon Force – one with standard sails and the other with Alan’s own sails both took to the water for the first time today. The standard sails were found to be a little fluttery, and did not produce the same power or stability as the new sails. No formal racing was undertaken on this shakedown/maiden voyage. Alan also brought his John Simpson designed IOM which he has modified with a very short fin, problems with rigging and rudder control limited the days activities. Eric brought down his recently acquired Vic Smeed designed R36r, which with it’s strong hard chines will be interesting to see sailing as he gets chance to finesse the rigging somewhat . Next Meeting 09:30hrs – WEST SHORE LAKE – Sunday 15th December 2013 – Bring a boat and have a sail, or come on down and have a go. Some 126 years since it was first established the Llandudno Model Yacht Club is back up and running. During 2013 there were a number of club sailing sessions and also the UK – USA Challenge for vane 36’s which was well attended with over 20 boats taking part. The club recently held it’s first AGM which was well attended and set the scene for the 2014 sailing programme both vane and radio with the election of officers taking place from within the small but keen membership. The website will become populated with more pages over the next few weeks and months so bookmark us and pop back soon!